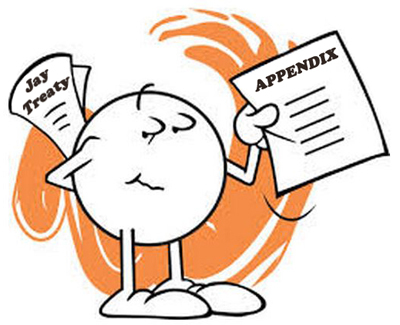 This is the appendix of the Jay Treaty. Here is the main article. And go here for the transcript. I am honored with yours of August 30th. Mine of the 7th of that month assured you that measures were taken for excluding from all further asylum in our ports vessels armed in them to cruise on nations with which we are at peace, and for the restoration of the prizes, the Lovely Lass, Prince William Henry, and the Jane of Dublin, and that should the measures for restitution fail in their effect, the President considered it as incumbent on the United States to make compensation for the vessels. We are bound by our treaties with three of the belligerent nations, by all the means in our power to protect and defend their vessels and effects in our ports or waters, or on the seas near our shores, and to recover and restore the same to the right owners when taken from them. If all the means in our power are used, and fail in their effect, we are not bound by our treaties with those nations to make compensation. 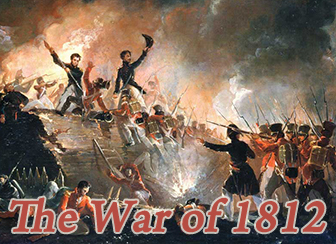 Though we have no similar treaty with Great Britain, it was the opinion of the President that we should use towards that nation the same rule, which, under this article, was to govern us with the other nations; and even to extend it to captures made on the high seas and brought into our ports; if done by vessels which had been armed within them. Having for particular reasons, forbore to use all the means in our power for the restitution of the three vessels mentioned in my letter of August 7th, the President thought it incumbent on the United States to make compensation for them. And though nothing was said in that letter of other vessels taken under like circumstances and brought in after the 5th of June and before the date of that letter, yet, when the same forbearance had taken place, it was and is his opinion that compensation would be equally due. As to prizes made under the same circumstances and brought in after the date of that letter, the President determined that all the means in our power should be used for their restitution. If these fail as we should not be bound by our treaties to make compensation to other powers in the analogous case, he did not mean to give an opinion that it ought to be done to Great Britain. But still, if any case shall arise subsequent to that date, the circumstances of which shall place them on similar ground with those before it, the President would think compensation equally incumbent on the United States. Instructions are given to the governors of the different States, to use all the means in their power for restoring prizes of this last description found within their ports. Though they will of course take measures to be informed of them, and the general government has given them the aid of the Custom-House Officers for this purpose, yet you will be sensible of the importance of multiplying the channels of their information, as far as shall depend on yourself or any person under your direction, in order that the governors may use the means in their power for making restitution. Without knowledge of the capture they cannot restore it. It will always be best to give the notice to them directly. But any information which you shall be pleased to send to me at any time, shall be forwarded to them as quickly as distance will permit. Hence you will perceive, sir, that the President contemplates restitution or compensation in the cases before the 7th of August; and after that date, restitution if it can be effected by any means in our power. And that it will be important that you should substantiate the fact that such prizes are in our ports or waters. Your list of the privateers illicitly armed in our ports is, I believe, correct. With respect to losses by detention, waste, or spoliation sustained by vessels taken, as before mentioned, between the dates of June 5th and August 7th, it is proposed as a provisional measure that the Collector of the Customs of the district and the British Consul, or any other person you please, shall appoint persons to establish the value of the vessel and cargo at the time of her capture, and of her arrival in the port into which she is brought, according to their value in that port. If this shall be agreeable to you, and you will be pleased to signify it to me with the names of the prizes understood to be of this description, instructions will be given accordingly to the Collector of the Customs where the respective vessels are. I have the honor to be etc.